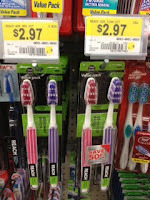 Hurry over to your nearest Walmart to score Reach Toothbrushes (2 Packs) for only $0.74 a piece! See the deal scenario below. $1.47 or $0.74 a piece!